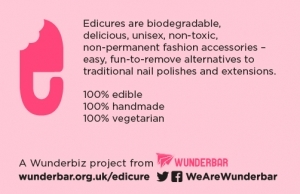 Just in time for our stall last week at the Urban Village Fete, we launched a new look for the Edicure. And here it is, in all its gold spangled glory. We have business cards and a sign and everything. The stall itself looked as good as it could, and the ready designed edi-nails went down a treat with the Londoners. Another development was the edible stick-on jewels. With the original inspiration of the nail caviar/ hundreds and thousands similarity, I went on a mission to create pearlised, individual jewels to stick on the nails. it kept me well occupied on the train down to London. 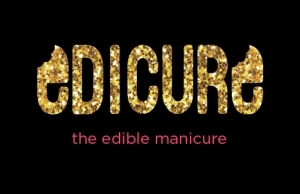 By way of feedback, one group of girls asked me to move into their school, so they could have edible nails everyday. Many other customers were threatening against baths that eve, so the could keep their delicate adornments until class on Monday. Adults got in on the action too. I had a range of requests for parties – both the kids kind and corporate events. So I know we are onto something. Best comment of the day came from a dad, and a legal professor to boot. He proclaimed Edicures nothing short of “profoundly cool.” Best compliment ever. With big thanks to Home Live Art and the Urban Village fete for having us and to Catherine and Lucy for their help. And of course Sally of Morph Creative for the logo/design/glitter-fest!